Nagina means “Jewel”. This place was named by Syed Ghalib Ali who received this place as Gift from Mughals. He founded the city and built the Nagina Castle. 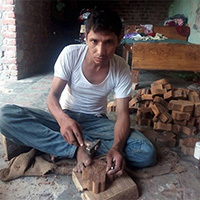 Nagina is also known as ‘Wood Craft City’. It has deeper and rich cultural impact on the art and craft traditions of India. 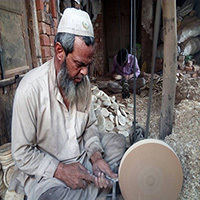 The history of wood craft in Nagina is about five hundred years old. Nagina is famous for its wooden handicrafts, especially ebony work. 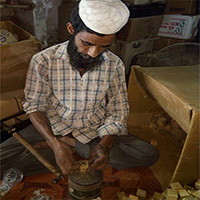 Artisans make items with different woods like Sheesham, Mango, Rose, Babool etc., which includes Wooden Boxes, Jewelry Boxes, Tea Boxes, Coffee Boxes, Incense Boxes, Game Boxes, Candle Holders, Paper Rack, Pen Holders, Paper Cutter, Coasters Sets, Ashtrays, Wooden Jewelry, Smoking Pipes, Door Handles, Walking Sticks, Nautical tables, Furniture etc. exclusive brass and wooden inlaid boxes and engravings are very popular. The evolution of Art and Craft has been organic and was inspired by the flora of the region. The geographical proximity of the area always have the raw material (wood) and naturally available in abundance to act as a canvas for these handicraft traditions. Nagina Artisans are worldwide famous for their Art and have their own identity. We are trying to improve the living standard of our artisan community and focusing to improve their child’s education & health. There is a group of 300 Artisan members in Master Piece Crafts Artisan Community and both Men & Women Artisans are working in their areas with responsibility and credibility. 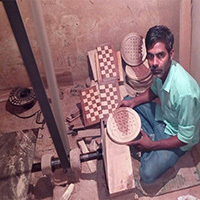 Our Wooden Artisans make different products like Wooden Boxes, Photo frames, Wall Décor, Trays, Coasters, Toys, Games & Puzzles, Bowls, Incense Holder, Candle Stand & Tea Light Holders and Jewelry etc. using different types of sustainable woods. We are trying to improve the living standard of our artisan community and focusing to improve their child’s education & health.